The first ProNova SC360 is now available in Franklin. FRANKLIN, TN — Provision Healthcare is developing another advanced comprehensive Provision CARES Cancer Center in Franklin, TN which will include one of the most promising new cancer therapies now available – proton therapy. The Provision CARES Proton Therapy Center, a key feature of the cancer center, will utilize the latest advancement in proton therapy systems – the ProNova SC360. Recently, one of the key components of the system, the cyclotron, was transported from the cyclotron staging facility in West Nashville to the proton center construction site. The cyclotron traveled the 24.6 miles from Centennial Boulevard to Carothers Parkway on a flatbed truck on a TDOT pre-approved route. The cyclotron travel time was expected to take 2-3 hours before arrival at the site. Once the cyclotron had arrived at the proton center, the Provision team, which includes personnel from Sumitomo Heavy Industries, Ltd., headquartered in Tokyo, Japan, Barnhart Crane & Rigging Co., with headquarters in Memphis, TN and ProNova Solutions, LLC, with headquarters in Maryville, TN would then begin the rigging and installation of the cyclotron into the new proton therapy center building. Other equipment had already begun the installation process at the proton center. Upon installation of the cyclotron, testing and commissioning of the ProNova SC360 will continue as the proton therapy center building is completed. Provision’s cyclotron was pre-assembled in West Nashville and will be fully installed and commissioned at the Provision CARES Cancer Center in Franklin, Tennessee. The cyclotron produces a proton beam that is incorporated into the ProNova SC360 delivery system and then used to deliver this advanced cancer treatment. This treatment provides a means to treat the cancer and spare the patient with few side effects. The Provision CARES Proton Center is currently under construction at the Provision CARES Cancer Center and is located on an 11.6-acre parcel near Williamson Medical Center on Carothers Parkway. Provision Healthcare’s leadership team, cancer center partners, and media will be viewing the cyclotron delivery from the construction site at 4588 Carothers Parkway, Franklin, Tennessee. Proton therapy is an advanced form of radiation therapy that uses a single beam of high-energy protons to treat various forms of cancer. 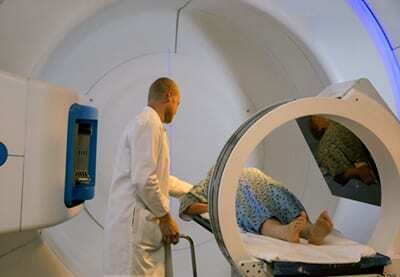 Proton therapy treats tumors by directing radiation into the tumor site destroying cancerous cells. Unlike with other forms of radiation, Physicians can control both the dose and range of protons, which allows the maximum deposition of energy into the tumor. This reduces damage to nearby healthy tissue and limits negative side effects. Proton treatment can be combined with chemotherapy and biological treatments, depending on the cancer type, to provide better outcomes with less tissue damage. According to the National Association of Proton Therapy, there are currently 26 proton therapy centers in operation with 11 under construction or in development. A division of Provision Healthcare, ProNova is committed to making proton therapy accessible to a greater number of patients and physicians worldwide. ProNova was founded by former leaders of CTI Molecular Imaging, which brought positron emission tomography (PET) technology out of the laboratory and made it a clinical reality for millions of cancer patients. Today the same team is redefining cancer treatment once again with the introduction of the first and only superconducting 360-degree compact proton therapy system. It is the only proton therapy system developed in a clinical setting, benefitting from continuous input from physicians, medical physicists, and therapists during the course of design and development. The system includes state-of-the-art features such as pencil beam scanning and advanced imaging with conebeam CT, all in a compact design. Provision Healthcare, LLC (Provision) was formed in 2005 with the purpose of developing innovative healthcare solutions focused on improving patient care and clinical outcomes and developing support for research, educational and charitable causes. Provision has developed a unique, comprehensive expertise in proton therapy that distinguishes it from other proton and cancer center developers and operators that have a much narrower focus. The combination of unique expertise and an innovative, entrepreneurial approach continues to propel Provision towards a position of industry leadership with respect to both cancer care and proton therapy.